Christine Palmer – Who is Rachel playing? Home Film Projects Christine Palmer – Who is Rachel playing? With “Doctor Strange” soon hitting the theaters (Nov 4th) and with the first ever TV spot (embedded below) being released earlier this week we only thought it appropriate to talk about Christine Palmer. You know, the character Rachel is playing in the movie. Oh, you actually don’t know who that is? Well, let us give you a quick run-through of a character whose appearance might be Marvel hinting at something big! 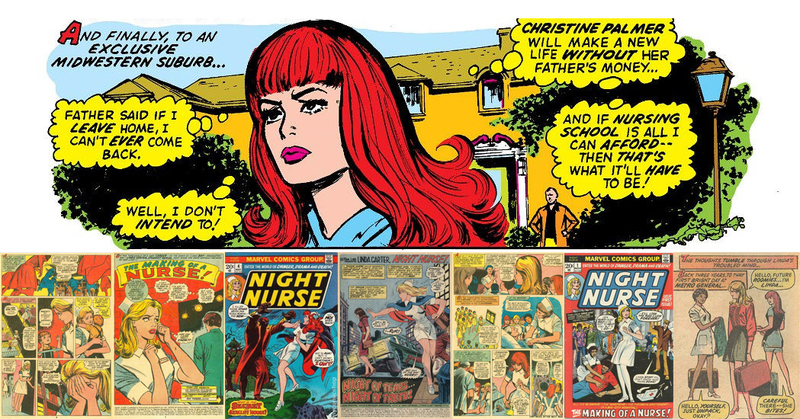 Between 1972 and 1973 Marvel released a new series of comics, namely “Night Nurse“, in an attempt to draw in female readers, whom, at that point, were very few. The comics center around three female nurses, working at a secret clinic in New York, whose main purpose is to treat superheroes that can not turn to regular hospitals. These three nurses are Linda Carter, Georgia Jenkins, and Rachel’s character, Christine Palmer, whom all bear the title “Night Nurse”. In the series you follow their “drama, danger, death”-type life in a Marvel superhero cross-over platform that is the clinic. Now, I talk about the Night Nurses as a group but there is one that, essentially, is the lead character – Linda Carter. The story focuses mainly on her and the only connection to the “Doctor Strange“-comics is between Linda Carter and the doctor himself. Throughout the story-line of Linda Carter she has occasionally teamed up with Dr. Strange and the two have even shared a few romantic moments. This makes you wonder, why isn’t Rachel playing the character of Linda Carter instead of Christine Palmer? She seems to have the role of someone who is close to Dr. Strange, I mean, just judging by the trailer where she is worryingly by Strange’s side at the hospital (!). I don’t have the answer. Sorry. One can of course speculate, and that’s when it gets interesting! You see, this role of Linda Carter was previously thought to be played by actress Rosario Dawson in the Netflix original series, “Daredevil“, back in early 2015. But it was eventually revealed that she (Rosario) was playing another Marvel character named Claire Temple (who shares a very similar background to Linda Carter). It doesn’t take a genius to figure out that the mentioned Night Nurse is Linda Carter, especially since she is featured in the “Daredevil” comics. From there, one can assume that the makers of “Doctor Strange” were met with the same restriction. And what this could mean . . .
. . . is that, maybe, there is a “Night Nurse” series in the works (which in itself would be awesome) that most probably would feature Rachel, playing Christine Palmer, as part of the crew. Now, that would be a huge deal for Rachel McAdams! But, one can never be sure when it comes to the realm of the Marvel Cinematic Universe. One can, however, hope.